Sometimes it’s about the destination and the journey. A summertime road trip should be an adventure from start to finish, with meaningful stops along the way. 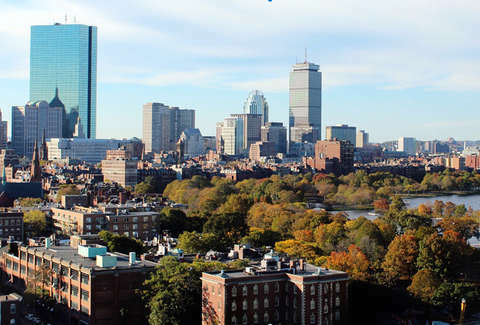 And Boston to Newport? 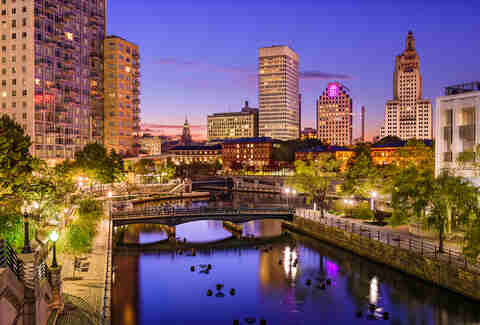 A veritable sojourn through nature and history on the way to one of New England’s oldest and most picturesque towns. Think you’ve had authentic Italian food stateside? You’ll rue that naiveté after biting into your first cannoli on Federal Hill. Called “the Heartbeat of Providence,” Federal Hill is a smorgasbord of eateries; Atwall Avenue alone houses 20 restaurants in just a quarter-mile stretch. You can opt for a formal food tour of the neighborhood or simply wander around and discover a wondrous hole in the wall that’ll upend your understanding of pasta’s possibilities. And don’t you dare leave empty-handed: Hit a classic Italian market for pantry staples like olive oil and flavored pizzelle on your way out. Time to stretch your legs. Take a slight detour to the southern tip of Jamestown, a bucolic town situated almost entirely on an island, then get out and breathe deep the scents of Narragansett Bay. 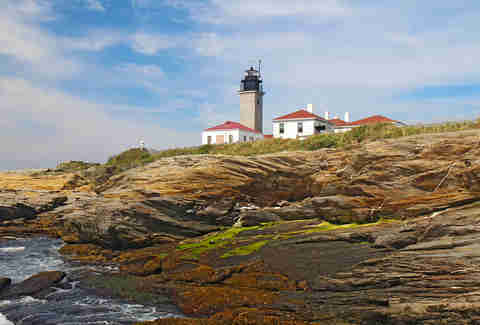 After that, take a selfie in front of Beavertail State Park Lighthouse, the third oldest lighthouse in America, and then be on your way. Ask a Little Compton native about their best beaches and you might get a stony look. The truth is, locals don’t necessarily want you to know how lovely their coastline is. It’s their little secret. So respect the stillness and serenity of this gorgeous Nature Conservancy spot, the private side of the town-managed South Side Beach. 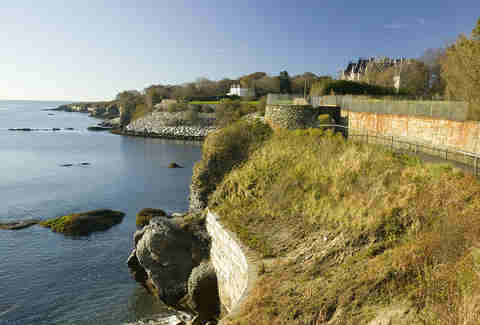 Manhattan has the High Line, Newport has Cliff Walk. Thing is, Cliff Walk predates the über-popular Manhattan attraction by more than 100 years. The public access walk provides a double-whammy of stunning scenery, with the rocky shoreline on one side and the backyards of some of the country’s most iconic estates on the other. The 3.5-mile walk can be strolled in pieces or all in one stretch, with time allowed for bench pontifications and a bit of beach detouring, with stairways off the path down to several small coves. Alternately known as Ocean Drive, the mansion tour takes you back in time to the Gilded Era, when folks with names like Vanderbilt and Astor threw lavish parties at their 40,000-square-foot summer cottages and basked in the glories of the pre income-tax era. You can take a trolley tour and learn the formal history of the mansions; drive yourself between sprawling properties, or latch onto a local and indulge in hush-hush tales of pettiness and revenge among the one-time 400 richest Americans. One thing’s for sure: Your real-estate envy will be turned up to 11. Newport sunsets require #nofilter. 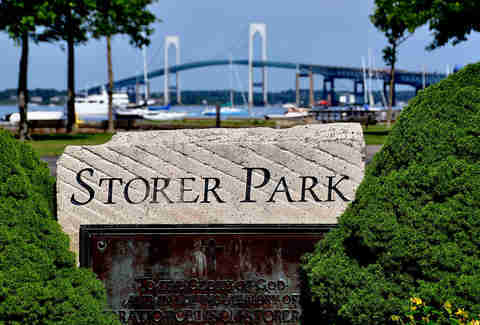 One of the best public spots to grab an IG-ready pic in the summer is at the modest shoreside Storer Park, which gives you an unfettered view of both the Newport Bridge and the Rose Island lighthouse in the foreground. Time to pull out your petticoats, because you’re about to pass through an 18th-century village, one that was once part of the original Plymouth Colony. Take some time to drink in the details of the colonial architecture before popping into some of the art galleries, crafts shops, and antique stores to pick up a timeless piece of memorabilia.